Three star hotel near Seorak mountain and cheongcho lake! 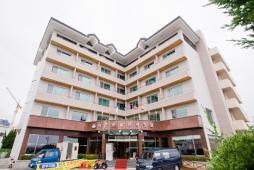 Sokcho Royal Tourist Hotel opened its doors at the heart of Sokcho in 1990. Conveniently situated nearby surrounding tourist attractions, shopping, and leisure entertainment, and is in 10 mins walking distance from Sokcho Bus Terminal. Since remodeling in 2006, the hotel has become a grander accommodation where guests can enjoy the views of the pristine lake, sparkling city lights, and regal mountain views. Eunseo's house from the Korean TV drama "Autumn in my Heart" at Cheongco Lake and Cheongchodong is also nearby. Local adventure at Ulleung Island Passenger Ship Terminal, sushi restaurants, Sokcho central market, and great fishing spots along the east coast are available. And with boat and amusement rides at Cheongcho Lake to enjoy, guests are bound to have fun!